Neck pain is one of the most common types of injuries and it affects people from all walks of life. Many times you have no idea what has caused your neck to hurt but it sure gets in the way of doing all of your normal activities. Neck pain can feel like a knot, frequent stiffness especially in the mornings after waking, or very severe pain that starts in your neck and feels like it is travelling into your shoulder or down your arm. Sometimes it can feel like it is pain in your upper back or it can cause headaches. Most often it affects your ability to turn your head or look up or down. Driving can be difficult. Occasionally you may feel that you have numbness, weakness or tingling down one or both arms. 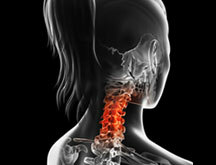 You may have neck pain as a result of whiplash from a fall or a motor vehicle accident. The causes of neck pain are diverse ranging from joint pain to disc pain to ligament injury from whiplash. Sometimes it can be caused from compression of a nerve either from a disc herniation or degenerative changes in the joints. No matter what the cause, it always gets in the way of every day life activities! It can interfere with all the fun things that you would rather be doing and can often interfere with sleep! We can help! The physiotherapists and Massage Therapists at PhysioNow are trained in the most up to date treatments available to make the pain go away quickly. We have helped thousands of patients to get back to their lives. Let us help you too! Neck pain can be caused by a variety of different reasons, including trauma like a fall or motor vehicle accident, poor posture, repetitive activities, bony changes like osteoarthritis and stress. What is the best treatment for neck pain? Physiotherapy is an effective treatment option for neck pain, whatever the reason of the pain. A physiotherapist will be able to do a combination of various treatment options to help get rid of pain and improve the patient’s quality of life. Treatments may include manual therapy, like mobilizations and soft tissue work, electrical modalities to help with the pain, exercises to stretch and strengthen and education. Is my pillow causing my neck pain? Can treatment be a better option than surgery for neck pain? Surgery for neck pain is a rarely prescribed treatment option. This is because these types of surgeries do not always correct the symptoms that the patient is experiencing. Therefore, the trauma and the recovery time of the surgery is not always worth the outcome. Physiotherapy treatment is a much better option for neck pain since it is non-invasive and can provide a lot of relief and in a lot of cases, abolish the symptom all together. I cannot turn my head fully to the left or right. Can physio help with range of motion? Physiotherapy can definitely help with regaining any lost range of motion. The physiotherapist will assess the patient and determine what the source of their restriction is and apply the most appropriate treatment to help that restriction. The physiotherapist will also provide home exercises so that the patient can continue to maintain their range of motion and prevent any re-occurrences.